What Can We Expect When ExOne Co Reports Earnings? ExOne's previously delayed earnings report comes out soon. Will we finally get some good news? Advanced metals 3D printer maker (and also supplier of printed parts) ExOne Co (NASDAQ:XONE) is scheduled to release its first-quarter earnings report on June 11, and that's just around the corner. The company has missed earnings estimates relatively regularly since going public back in 2012. Add in the delayed release due to a problem with ERP software implementation, and there's more reason some investors are concerned. Let's take a closer look at the expectations, and get some idea of what to expect. ExOne's biggest subsidiary is in Germany, and this segment has apparently had major delays with implementation of a new enterprise resource planning system (which ironically is supposed to improve reporting controls). This is what is driving the delay in reporting earnings. That said, the company has had a track record of missing expectations, and having relatively "bumpy" results. However, it's important to consider quarterly results at ExOne within the context of the company's business. ExOne's high-end, advanced metals printers cost a lot of money, and each machine takes a pretty major commitment from a buyer. These devices become mission-critical production systems as soon as they are implemented, and this means that it can take a lot of time for a deal to move from a handshake agreement to fully billed and paid for. Add in the fact that ExOne is still very small, and a single large deal can have outsize impact on quarterly results. With this in mind, it's probably best not to put too much emphasis on the results of any one particular quarter, or even two or three, but instead to look for trends, especially when it comes to the things that will drive profits as the business scales up. Sales last quarter were up strongly: 46% growth in machine sales, and 51% growth in non-machine (parts, supplies, and printed components) sales. Gross margin -- one of those profit drivers to keep an eye on -- unfortunately fell from 31% to 24.5% from the year-ago period. The end result was that gross profit dollars only went up 18%, or about $600 grand, even though total revenue was up more than $5 million in the period. So what gives? According to management, it's the cost of expanding and growth. CEO Kent Rockwell pointed to the company's move to significantly expand its European and U.S. manufacturing -- projects that were ongoing last quarter -- that largely affected margins. In short, the long-term gains these new facilities will provide led to short-term pains as they company gets everything operational. There was also a massive (for a company that size) $2.2 million in bad debt in the quarter. While the company said it will aggressively pursue payment, that's a huge amount of money for a company ExOne's size not to be able to collect. On the earnings call, CFO Brian Smith indicated that a lot of it was related to the macroeconomic situation in eastern Europe and Russia, but that was only part of it. It's also important to note that the company hasn't "lost" that money, but simply taken reserves on the receivables that it is moving to bad debt, in the event that it can't collect. Capital expenditures between $5 million and $7 million. That would put full-year sales somewhere between $58 million and $66 million, which management expects to see 65% to 70% of in the second half of the year, due to typical budgeting patterns for these kinds of big-ticket investments. So that would make the "back of the napkin" expectation for sales in Q1 to fall between $8 million and $10 million or so. But let's remember that the company's quarterly results have proven to be very hard to predict, so don't put too much weight in that estimate, or how the company performs against it. 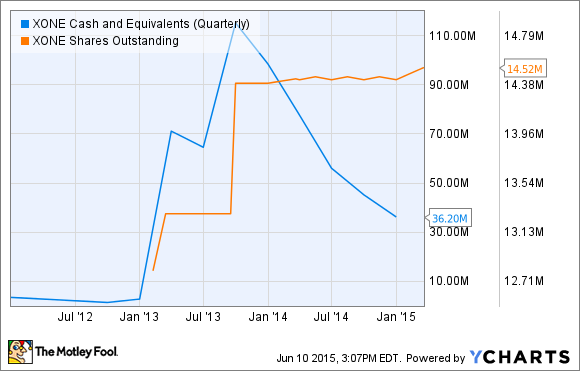 XONE Cash and Equivalents (Quarterly) data by YCharts. Since going public, the company has used equity offerings to raise cash, but at some point it will need to count on its core business to produce excess cash. I'm not making a prediction on when that will happen, but the $36 million on hand won't last long at the current burn rate. While we shouldn't put too much weight on any single quarter's results, the company's investments in new facilities should begin contributing to improve profitability metrics at some point in the near future. Will that happen when we get Q1's results? Honestly, I don't think so -- not quite yet -- because of the slow nature of the first quarter, and the ongoing efforts to transition to the new facilities. With that in mind, don't be too disappointed if the numbers aren't significantly better this quarter. ExOne's technology remains some of the best for advanced metals printing, but it's going to take a little time for this small company to grow into its potential.